Huge lawn, private sandy beach and a spacious interior the family will love. River’s Edge Beach House is nestled among the oak trees right on the Spokane River and has incredible features both inside and out. 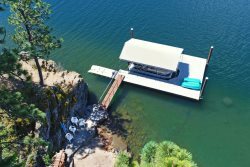 You can head to downtown Coeur d’Alene via a 15 minute car ride or hop on a boat from the private dock and take the river a short stretch to where it feeds into Lake Coeur d’Alene. This home is so packed with amenities you may never want to leave! Featuring beautiful rustic décor, the interior is incredibly spacious. The welcome living room has beautiful views of the water, comfortable seating, a TV, fireplace and access to the upper deck. On-site dining is easy thanks to the fully stocked kitchen. The large countertops offer plenty of space to prepare meals and the bar with seating for 3 is great for recruiting company to assist and socialize. Everyone will love gathering around the wooden table in the dining room with fantastic views of the water out the large windows. The bedrooms in this home are truly fantastic! The master has a king bed, two other bedrooms have queen beds—and all three have TVs and private deck access! Perfect for the kiddos, the fourth bedroom has a twin bunk bed and a TV. If you’re in need of an additional bed, a comfortable futon is located in the living room. There are three spacious full bathrooms. Two, including the master, have shower/tubs and the third has a standing shower. As incredible as the indoors are, you may love the outdoor features even more. The upper deck has a table with an umbrella, seating and an outdoor refrigerator. Situated right below, the lower covered deck has a second outdoor refrigerator, BBQ, hot tub, table with chairs and a great socializing area with additional seating. Right in front of these decks is a huge grassy lawn with even more amenities! The lawn leads right up to the 75’ foot private sandy beach. There’s also a private boat dock with chairs and an umbrella for shade. A paved fire pit area with seating is located near the beach and another dining area with a large table and chairs is steps away. Bring everyone together for fun-filled getaway at River’s Edge Beach House. Matt and Melissa were fabulous! Lots of space and a great boat dock! Everything we needed for a fun vacation! Booking experience was a breeze-very friendly office help. We experienced a small issue with the hot tub the first day and maintenance was sent within an hour or two of the phone call and fixed the problem. House was clean when we arrived! The team members are outstanding to work with. Very friendly service administered quickly and efficiently. This is the third year we have rented a house and stayed in CDA area-this property was rated as the top one out of the three by our family. Very Pleased with our stay at the "Beach House". We highly recommend this property. Everyone was so friendly and kind and helpful and responsive. You have a wonderful team that is very friendly, responsive and professional. Perfect location on Spokane River- Great home for large family-The house was great but we lived outdoors because the decks, yard, doc and river were wonderful.